Spring is here and it brings with it a cheerful mood, more daylight and a bit more energy to try new things. 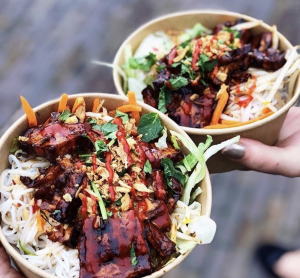 We’ve gathered some information on amazing pop-ups worth visiting if you’re craving some delicious food or just want to experience the vibe of North London. If you’re around Highbury and Islington, Finsbury Park or Stoke Newington, you’ve probably passed by a small but unique neighbourhood bar. Mountgrove Bothy is an ideal escape from the outside world with wine and seasonal food. 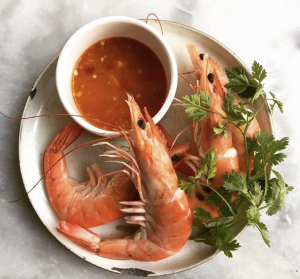 AngloThai, with John Chantarasak in the kitchen, will serve you authentic and highly-spiced Thai dishes. No reservations needed. If you are in London during Easter you should have a look at the Canopy Market which is located between Waitrose and St Martin’s College. During the Easter break, you will find not only great food but also a wide variety of activities across the three days. Street-food stalls will be there with homemade pasta, grilled cheese toasties and plenty of hot cross buns and chocolate for you to get your hands on! In addition, there is going to be a farm on site, a sheep show, face painting, art, Easter-egg hunt, a circus street performance and design workshop amongst other activities. If you don’t make it during the Easter festivities; starting from April, every Friday, Saturday and Sunday, the market regularly showcases local craft, art and design, also lots of different street-food stalls as well as live music and DJ events. 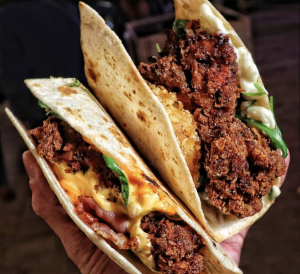 Moving over to the West, Kentish Town, you can stumble on some amazing fried chicken with Italian flatbreads. In February 2016 Jack decided to bring this Italian cuisine to London and you shouldn’t miss a chance to experience it! 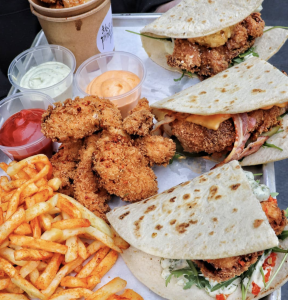 If you want to experience a huge variety of food, Chatsworth Road market will have something for you. Organic, free-range butcher, handmade pies, bread, cheese, ethically sourced handmade products from India, organic skincare products, natural hand knitting yarns, accessories, vintage clothing, street food, toasties, coffee. The list goes on. Take your pick! 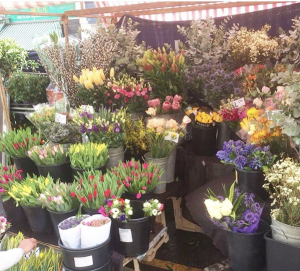 It closed down in 1900, but with the initiative of locals and traders, the market returned to London in 2010 and now is a regular Sunday market definitely worth visiting! 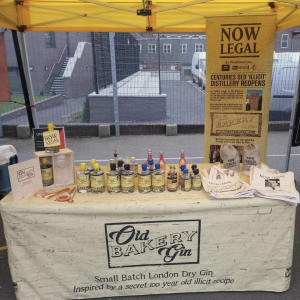 “We discovered that 100+ years ago the old bakery had a secret- they made illegal Gin!! … There was talk that the original Illcit Gin recipe included Stinging Nettle leaves, however we have tried to make it 100’s of different ways including Stinging nettles (including freezing the leaves & leaving them to soak in trays of sugar) but each time the taste has been awful. We hope you get to enjoy London to the fullest. If you want to have a healthy work-life balance and maybe check out all the great stuff happening in your neighbourhood this spring, we offer coworking spaces in North London – Hackney, Manor House or Colindale. Why not come and visit us in one of our spaces? We would love to give you a tour and show you what we have to offer! If you want to host your next event in one of our spaces get in touch.